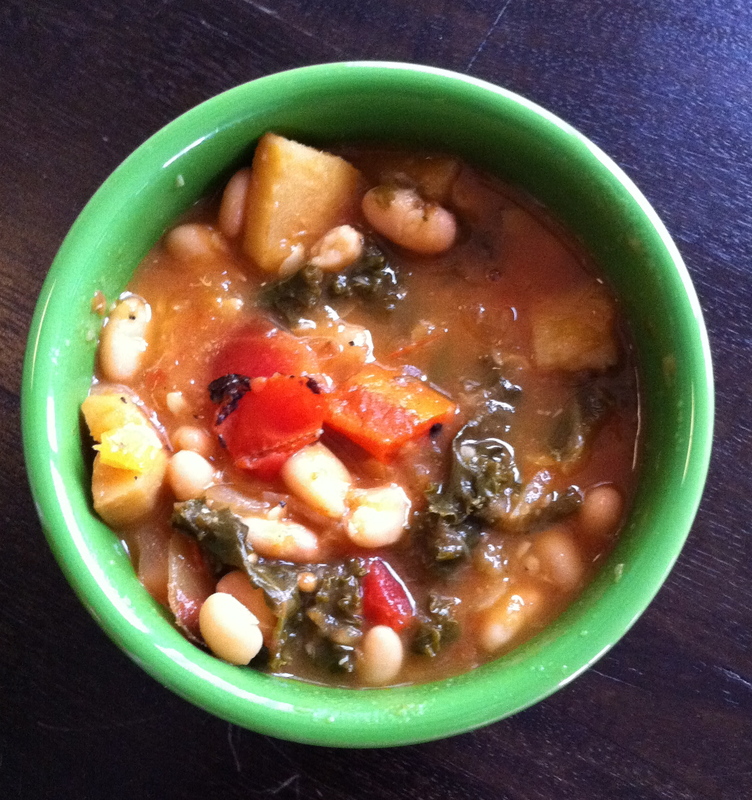 As bummed as I was to return to reality, one of the things I was looking forward to most about coming home was getting back into my kitchen and making this insanely delicious-looking recipe I picked out while I was away: Roasted vegetable, kale, and white bean soup. In other words, all of my favorite foods together in a single pot. Yes, please! There’s nothing I love more than when worlds collide—whether that’s bringing together different groups of friends or wearing Lululemon yoga leggings with a chunky sweater and riding boots. In this case, I was combining roasted veggies (obsessed) with soup (addicted). Take a quick breeze through this blog and you’ll notice that those two things constitute about 85 percent of the dishes I make…and yet they’ve never met. The thought of putting roasted vegetables in soup completely blew me away. What genius came up with that? I know it sounds silly to add an entirely separate step to the soup-making process (two if you count the blending action), but it is so, so worth it. Trust me. I ate this soup for lunch and dinner yesterday and it’s looking quite possible that there will be a repeat performance today. I realized afterward that when making ordinary soup the veggies don’t do much except get a little softer and look kind of pretty. But when you roast them…oh when you roast them they release their natural flavors plus gain that certain woodsy/earthiness that magically appears while browning in the oven. Also genius: Blending the tomatoes, onions, and squash before adding them to the broth to help thicken the soup. So. Freaking. Good. You know I’m a texture girl and that totally did it for me. If you’re someone who’s not so much a fan of brothy soups, this should be your go-to move. My newest goal in life is figuring out how to add blended roasted veggies to every soup recipe I make. Shoot for the moon, right? Preheat oven to 400. On one foil-lined baking sheet, place carrots, parsnip, and leek. Toss with olive oil, salt, and pepper. On another foil-lined baking sheet, place onion, tomatoes, squash, and garlic. Toss with olive oil, salt, and pepper. Place both sheets in the oven and roast for about 45 minutes until veggies brown, tossing occasionally. Place carrots, parsnip, and leek on a cutting board and cut into bite-sized pieces. Set aside. Peel garlic cloves and place in a food processor or blender with tomatoes, onion, and yellow squash. Puree until almost smooth. Place puree in a large pot with broth, kale, thyme, and bay leaf. Bring to a boil. Reduce heat to a simmer and cook until kale is tender, about 20-30 minutes. Add carrots, parsnip, leek, and beans to soup. Simmer about 15 minutes to blend flavors. Season with salt and pepper to taste. Before serving, remove thyme sprigs and bay leaf. 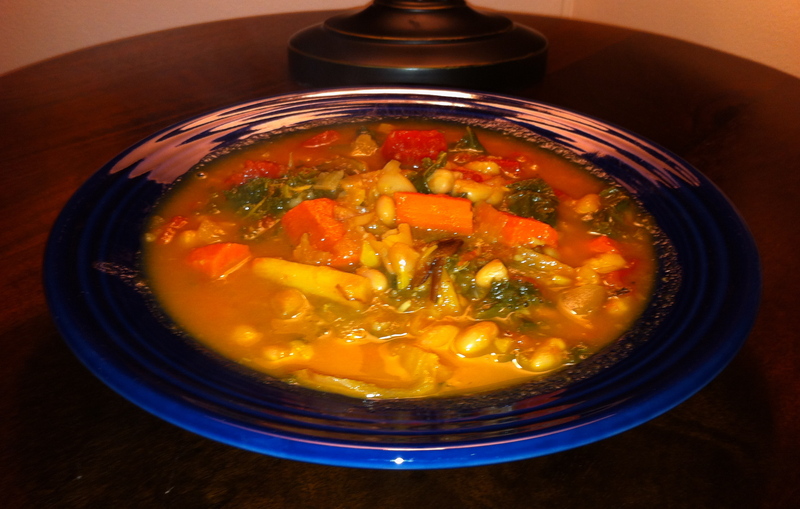 This entry was posted in Soup, Vegetables on November 29, 2011 by Paige Greenfield.